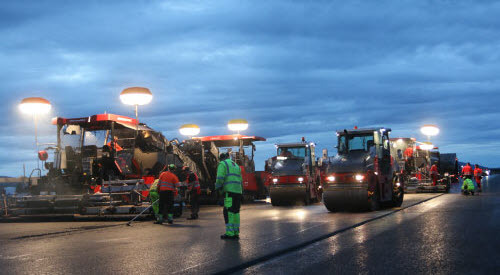 Four teams of 10 asphalt workers from Veidekke laid almost 20,000 tons of asphalt in 70 hours on Oslo Airport’s west runway. Geir Lange believes this may be a Norwegian record! Veidekke Industri, as subcontractor to Veidekke Entreprenør, landed a major contract with Oslo Lufthavn AS (OSL) for resurfacing the west runway. The asphalt work included milling and re-asphalting the base course and wearing course with a combined area of 183,000 m2. Asphalt grades: Asphalt concrete for base course and stone mastic asphalt for wearing course. Altogether it required 43,000 tons of high-grade PmB asphalt by the time the job was successfully concluded, being carried out in three stages and ending around mid July. Stopp&Belägg is at Oslo Airport on a fine summer night, following the work with block and camera. The first stop is Veidekke’s asphalt mixing plant at Ullensaker, the sole supplier for this phase of the airport job. Here we find foreman Jonny Hansen fully focused on remote management of production via computer screens. He explains that the plant (Benninghoven from Germany) has been in operation since the main airport was built in 1997 and will soon have produced a total of three million tons. He admits that the plant is old and ready for renewal soon, but it has been upgraded with modern computer technology and has a maximum production capacity of 200 tons per hour. “Just now we are producing SMA 11 stone mastic asphalt with polymer-modified bitumen for the wearing course at a rate of 143 tons per hour,” explains Hansen, who has worked at Veidekke since 1988. A highly-experienced asphalt maker, in other words. Nynas is the bitumen supplier for this large project at Norway’s main airport, while the polymer-modified bitumen used for the work comes from Veidekke’s own PmB plant at Moss. Veidekke’s asphalt contract started with milling of the surfaces in April. The actual laying of the base course and wearing course, a total of 43,000 tons, is divided into three stages. On this particular day they are in the middle of stage two. The client (OSL) doesn't allow any cross joints on the wearing course. Laying must therefore be a continuous process during the evening-night while the airport is closed. “The job is exciting, but demanding with all the logistics. We have been operating with double shifts of everyone plus spare hands. 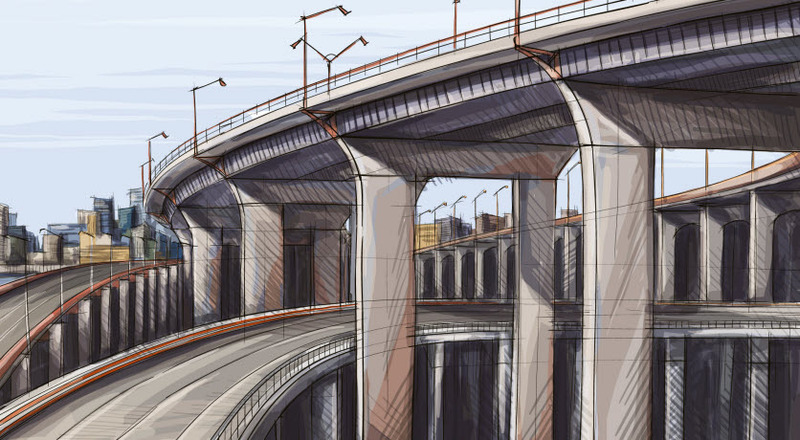 It can't be compared to a normal road job,” says Geir Lange. The first asphalt stage comprised 1,350 metres south of the west runway. This required 18,500 tons of asphalt, with two asphalt plants in full production. Four teams worked in 12-hour shifts and had one paver at their disposal. The transport element consisted of 37 lorries and 74 drivers (double the drivers). The job was completed in 70 hours. After the visit to the asphalt plant we enter the airport area, where the contractor is preparing for a new evening and night session of laying the wearing course. The runway length in stage two is almost as much as the record stage, and the tonnage is exactly the same, but the contractor now has more time and two pavers available. Two asphalt teams are in position in front of the pavers and waiting for the last planes to take off over their heads. After that they set to work. The lorries with new asphalt mix roll in and fill up the feeder, which then supplies fresh asphalt mix to the two belt-driven pavers. Side by side the new asphalt wearing course is spread at a width of five metres along the runway. 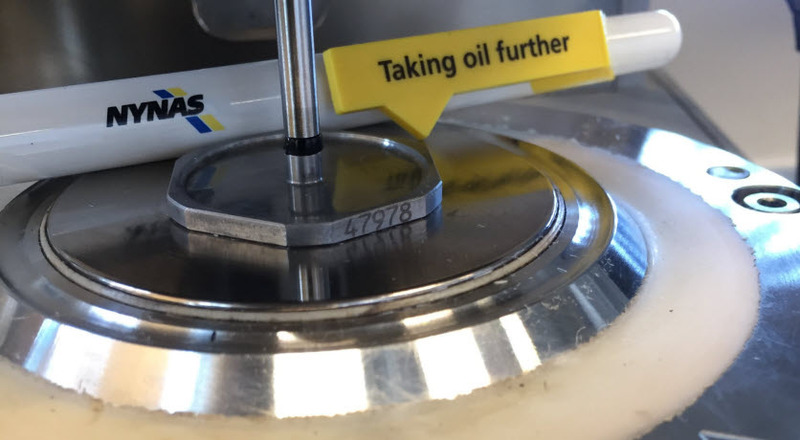 OSL will not tolerate any cross joints, so the operation must be continuous. The longitudinal joint is slanted, and the central cavity between the longitudinal joints is filled with pure bitumen. Four inspectors from Veidekke ensure that the work adheres to the rules. In addition, an inspector from OSL keeps a check on progress. 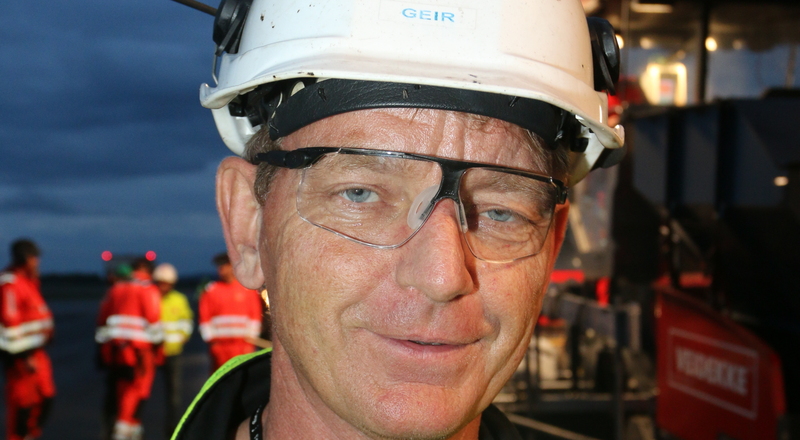 “This is the biggest job I have been involved with,” says Bjørn Ove Lerfald, one of Veidekke’s inspectors out in the field and ordinarily head of Veidekke Industri’s competence centre. “Security systems represent the biggest challenge, since every person and machine has to go through security checks every time they enter the area. Consequently, we can't take things on the fly. Everything must be carefully planned,” he says. 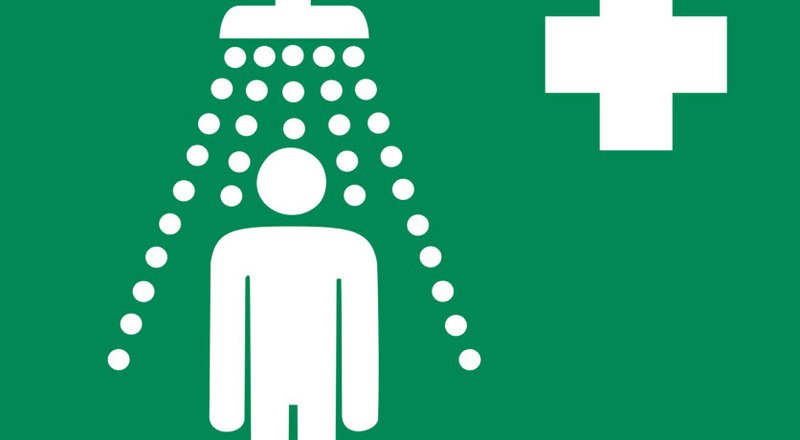 “Yes, we can’t just send a message for extra staff in an emergency. Without an ID card no one can get into the airport site. Everyone working here must have completed three obligatory EHS courses. OSL is a demanding customer. There are individual and strict procedures for everything that must be done, which has inevitably made logistics difficult. Stage two was completed two days after our visit, so only stage three remained, involving 400 metres and 6,000 tons in the centre of the runway, and this was planned for 10-12 July, weather permitting.